Vrabel was praised by Patriots coach Bill Belichick prior to the Texans' AFC divisional-round playoff loss at Gillette Stadium. Mike Vrabel was praised by Patriots coach Bill Belichick prior to the Texans' AFC divisional-round playoff loss at Gillette Stadium. When the Texans shuffled their coaching staff by promoting linebackers coach Mike Vrabel to defensive coordinator and defensive coordinator Romeo Crennel to assistant head coach, it was expected to be a seamless transition. So far, the move has been met with wide approval by the Texans' players. That includes three-time NFL Defensive Player of the Year J.J. Watt. "It's been very good," Watt said. "I think it's great. I think I've said all along, to have a guy like Mike come in who is so knowledgeable and so experienced is great. It's very good for us. "But then also to have RAC out there every single day and still coaching and teaching guys – to have two defensive minds like that, and then with the assistant coaches that we have, we are very fortunate." Vrabel was a versatile All-Pro outside linebacker with the New England Patriots who earned three Super Bowl rings. He was scheduled to interview for the Los Angeles Rams' head coaching job before it went to Sean McVay. He was offered the San Francisco 49ers' defensive coordinator job a year ago and was pursued by the Washington Redskins and San Diego Chargers this offseason. "Mike does a tremendous job," Belichick said. "As a player he was very astute, had a great understanding of his position and technique and how to play his spot and corresponding positions from an overall standpoint. He had a very good grasp of the overall defensive and offensive concepts and how they would attack different fronts. We talked about that. 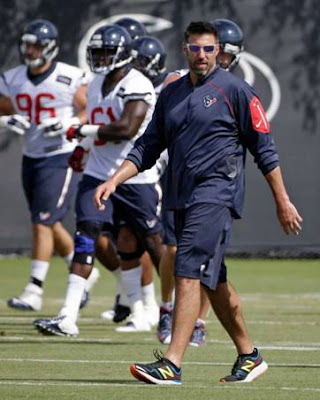 "Coach Vrabel has done an unbelievable job of teaching me where to be, in the right spot," said McKinney, who led the Texans with 129 tackles last season. "He's an unbelievable coach. He loves the game of football. He tells us how much he loves coaching us. He's a great coach. I'd be happy with whatever coach Vrabel decides to do. He's a great guy and a great coach."